Book Review: Georgi M. Derluguian. 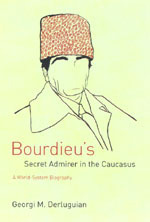 Bourdieu’s Secret Admirer in The Caucasus. A World-System Biography. I am approaching the review of this book with a lot of excitement and thrill. First of all, this is by far my favorite book about the Caucasus. Second, it is one of the few (and spectacular) examples of applying world-system analysis to post-Soviet material, and perhaps, the first work doing that for contemporary Caucasus. I should be honest, I failed all my homeworks and everything else when I came across this book: I could not stop reading until I finished the last line with along with the first rays of morning sun throwing light upon my sleeplessly desolate room. It is an incredibly compelling narrative, and the book is as dynamic as an adventure novel – which, to some extent, it is.